Dryden Flight Research Center, Palmdale, CA – Welcome to another Antarctic campaign with NASA’s Operation IceBridge. Over the next two months the IceBridge teams will be collecting data with two aircraft based in Punta Arenas, located at the southern tip of Chile. We have installed cutting-edge laser altimeters and extremely sensitive radars that will allow us to measure changes in thickness of the sea ice surrounding Antarctica. We will also be monitoring changes in the thickness of ice sheets and glaciers that cover 98% of the Antarctic continent. 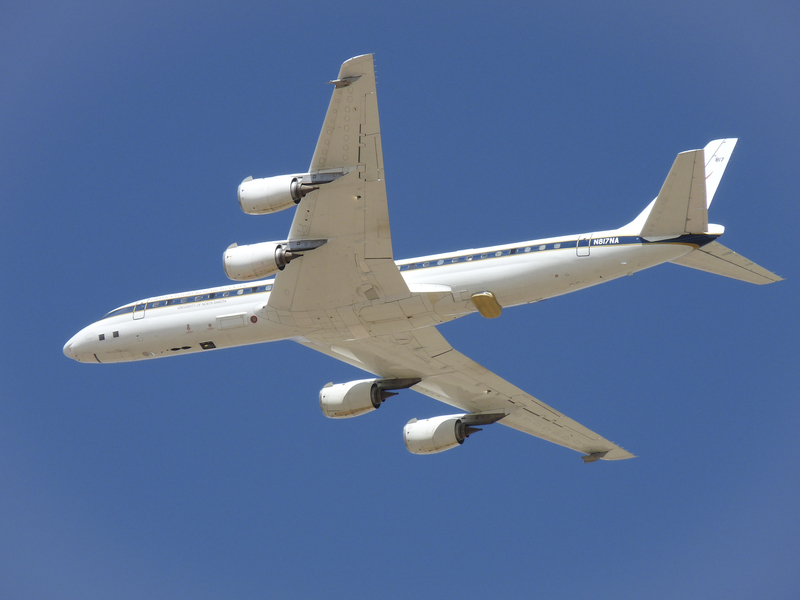 Before we can start collecting data over Antarctica we have to make sure that all installed sensors on NASA’s DC-8 work and are calibrated. (The second plane in this fall’s campaign, a Gulfstream-V operated by the National Science Foundation and the National Center for Atmospheric Research, has already landed in Punta Arenas and could start science flights as early as Friday.) In order to make extremely precise laser altimeter measurements of the ice surface elevation we use target sites in the Mojave Desert that we have surveyed on the ground to calibrate the instruments. El Mirage, a dry lake bed, not far away from Dryden’s Flight Research Center is a perfect target site to calibrate our laser. 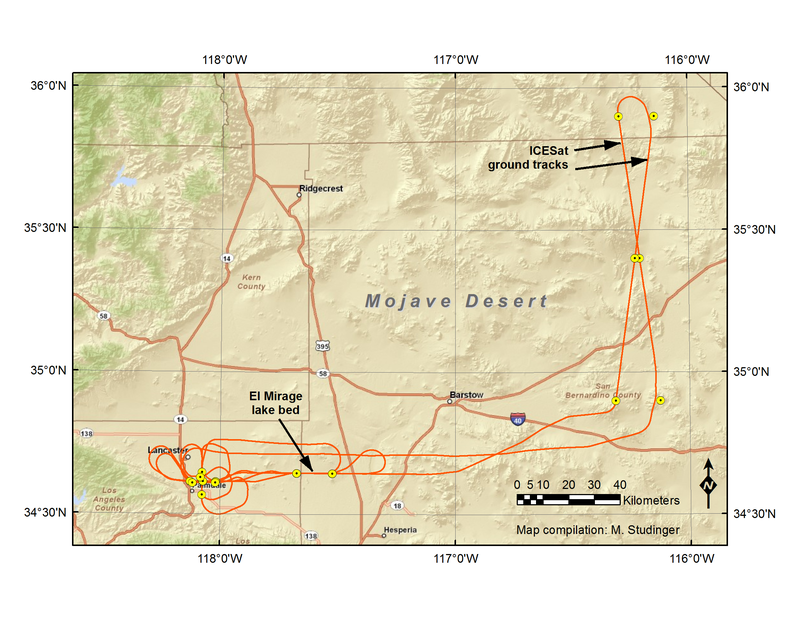 We also fly over the ramp at Dryden and over two ICESat ground tracks in the desert to make sure our equipment works. A second test flights takes us out over the Pacific Ocean, some 200 miles away from the coast, where we can switch on our radars without interfering with other systems. We use the radar signal that is bouncing back from the ocean surface to calibrate the radars. We did a couple of maneuvers at high-altitude over the Pacific Ocean to calibrate the antennas of the ice-penetrating radar systems that we will use to survey the sea ice, glaciers, and ice sheets. In a few days we will be ready to go south. In previous years we have laid down the foundation for repeat measurements of many glaciers and ice streams in Antarctica. This year we will be re-surveying our previous flight lines in order to determine how much these glaciers have changed compared to previous years. We also plan to survey a few new areas in order to establish baseline measurements for future years and for the upcoming ICESat-2 mission in 2016. The IceBridge teams have enjoyed working in sunny and warm California for a few weeks, preparing for our trip to Chile. We are looking forward to another successful campaign with exciting new data and spectacular Antarctic scenery. You can follow us on this blog and on Twitter at Twitter.com/nasa_ice.